The first thing I need to do is clear up what you're reading about. 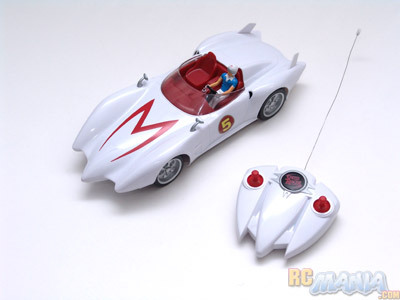 There were three full-function RC Speed Racer Mach 5's made by the major toy manufacturers when the new movie came out in 2008, all in distinctly different sizes. The smallest was 1/38th scale, smaller than an adult's hand. The largest was 1/10th scale, over a foot long. This one here is right in between at 1/16th scale. It's based on the Tyco 6V car drivetrain that we first tested here. 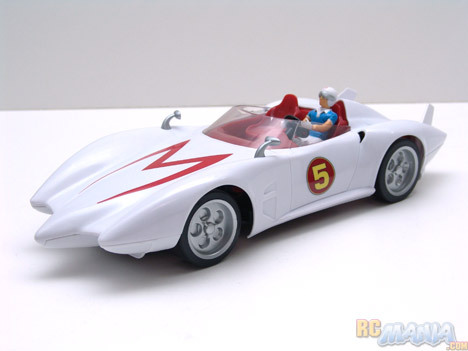 The car looks great, a pretty decent reproduction of the car from the movie and the classic comics, though the driver figure is a little small. The controller is sweet -- it's styled after the pointy front of the car, and the control sticks move very smoothly and feel high-quality. No surprises here, insert batteries and go! This car is very controllable and has a respectable speed. Steering works well and is consistent, and the real rubber tires run pretty quiet and give very good traction. It's a joy to drive around! I'm not writing a whole lot about this car because there isn't a lot to say -- but that isn't a bad thing. You get what you pay for, and it's just right for the age range it's made for. The speed is right, the controller is the appropriate size and feels and works well, and steering is responsive and predictable. This is a quality little car for young drivers!